After our long summer in Michigan, we headed towards Raleigh, NC where we would again serve as Camp Hosts in the Falls Lake State Recreation Area for the month of October. 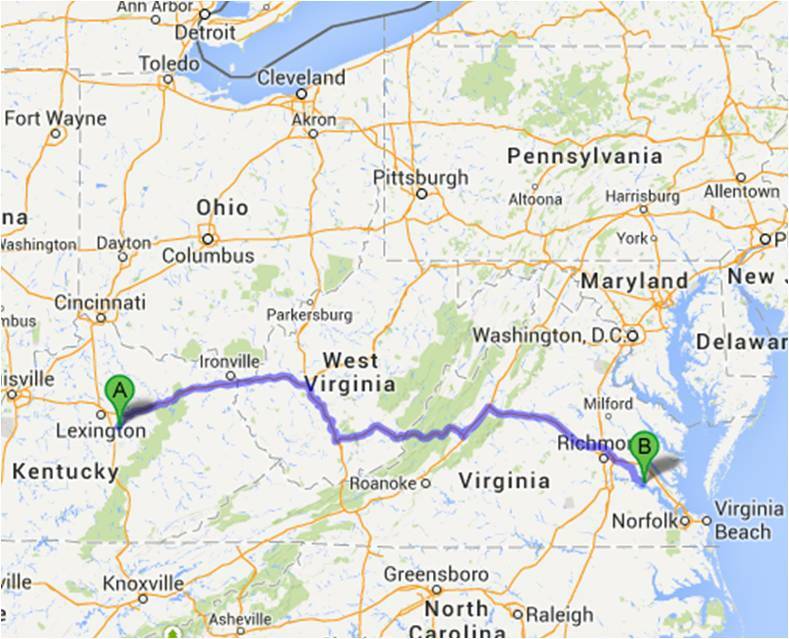 Our route was not the most direct, but allowed us to travel to some sites we had not visited in the past. I have a friend from the National Guard who lives near Lexington, KY and discovered that Daniel Boones’ Boonesborough was nearby. We met Bill and his wife, Phyllis, for lunch enroute to the campground. Phyllis and Pat had a good conversation while Bill and I swapped war stories and jump lies. 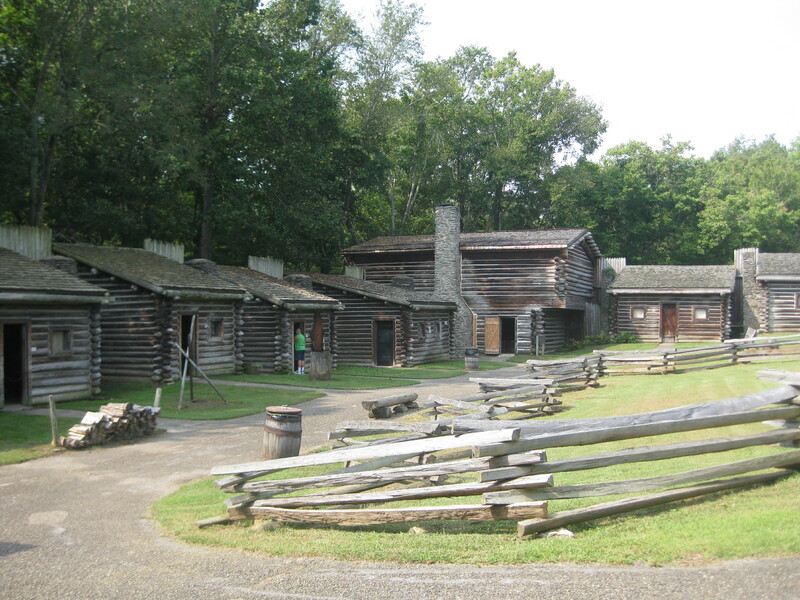 Fort Boonesborough State Park is right next to the site of the original Boonesborough settlement and the reconstructed Fort Boonesborough. The reconstructed fort has staff in period clothing that actually perform the tasks done by the original settlers, such as blacksmithing, soap making, leather and metal working. They made the history come alive as they talked and demonstrated their skills. Nearby is the Number Ten Lock and Dam on the Kentucky River. I have always been interested in river and lake navigation, and even more so since I have led the Leadership Development Program for the Corps of Engineers. This facility has been transferred from the U.S. Army Corps of Engineers to the State of Kentucky, and the state has restored one building and turned it into the Kentucky River Museum. From here we traveled to the Chickahominy Riverfront Park near Williamsburg. Unfortunately the trip was not without its problems. When we stopped for lunch on our first day of the trip I discovered we had a flat tire on the trailer. We called Good Sam’s Club for road assistance and soon a truck was out to jack up the trailer and replace the flat tire with the spare. I’m so glad we have the Good Sam’s Insurance on the trailer. One of the first things we did when to we got to the campground was to find a tire center and order a replacement. 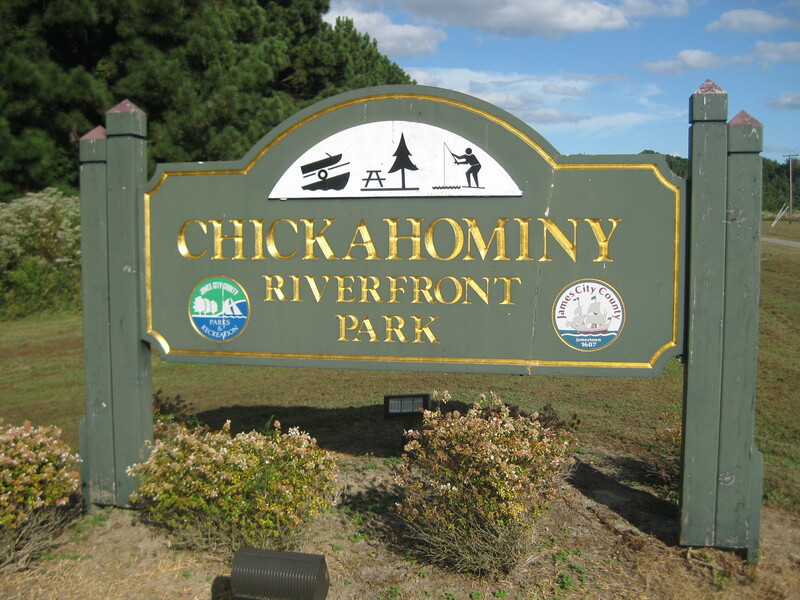 Chickahominy Riverfront Park is in what is referred to as the Historical Triangle of Williamsburg, Jamestown, and Yorktown. 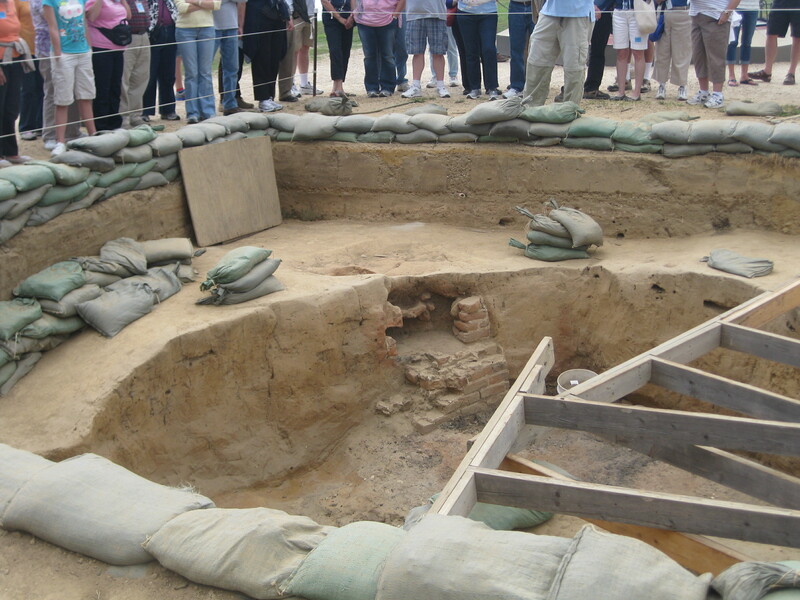 Both Yorktown and Jamestown have two sites, one operated by the National Park Service and the other operated by the Yorktown-Jamestown Foundation, an agency of the Commonwealth of Virginia. Our first visit was to the Yorktown Victory Center which has recreations of a Continental Army encampment and an 1780’s farm. There are historical interpreters in period attire that perform tasks that were done during the period and answer your questions. 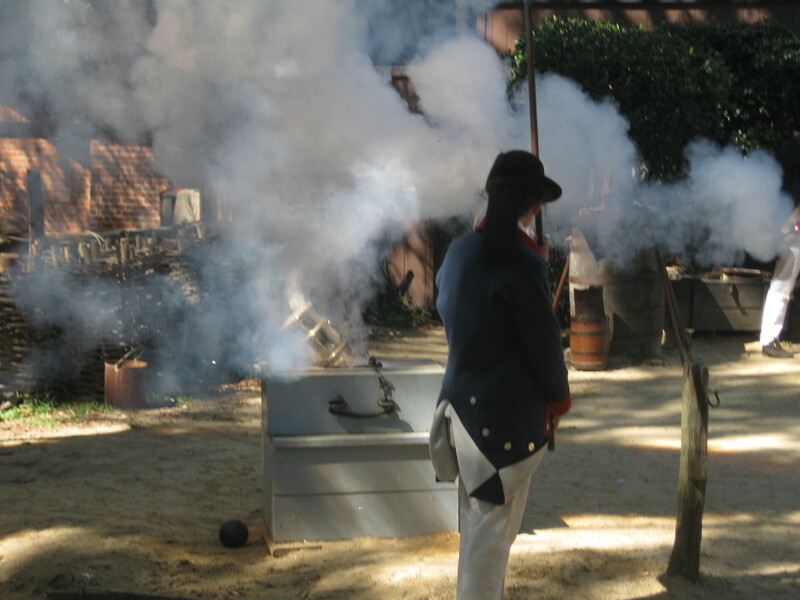 We watched as visitors assisted the interpreters in firing a Revolutionary War cannon. The Yorktown Battlefield is operated by the National Park Service and is the actual site of the Yorktown siege. Park Service Rangers give tours of the British positions, describing what General Cornwallis was trying to accomplish and how the battle progressed. We purchased a CD at the Visitors’ Center for a narrated auto tour of the battlefield. The CD is narrated by a British and an American officer and is a good way to understand how the battle was fought. You get a true sense of history when you stand on the actual fighting positions of the battles fought to win our freedom. As a side note, when we were getting our admission to the Yorktown Victory Center, I discovered that I didn’t have my driver license. I realized that I had left it at a gas station in Ohio. Fortunately I was able to contact them and they were willing to mail it to me at our daughter’s house in Raleigh, NC. Until then Pat had to do the driving. Yorktown is where we won our independence, but Jamestown is where our country began with the first permanent settlement, thirteen years before the Pilgrims landed at Plymouth. The Jamestown Settlement is operated by the Yorktown-Jamestown Foundation. 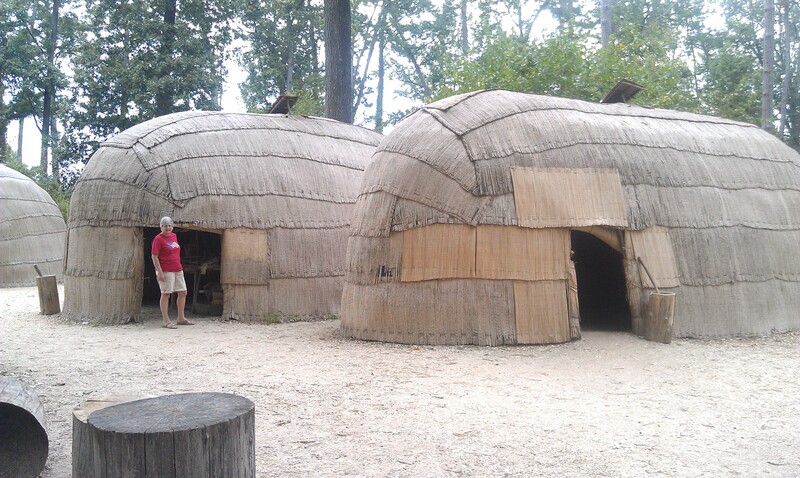 Located near the historic Jamestown site, it has full-size replicas of the 1608 fort, an Indian village, and the three ships led by Captain John Smith to establish Jamestown. As we toured the ships, we were struck by how small the ships were and how uncomfortable the voyage must have been for those early settlers. 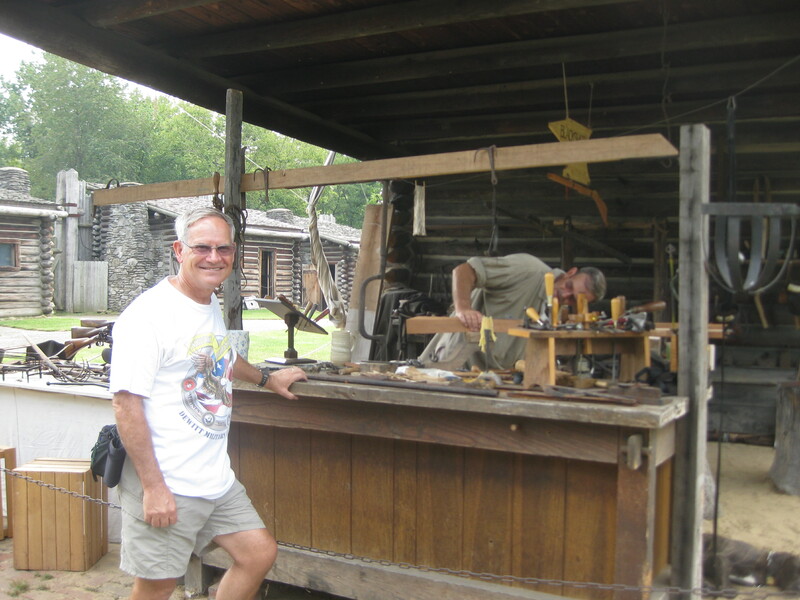 In the village and the fort historical interpreters demonstrated firearms, glass-blowing, fire building with flint and steel, and other period activities. 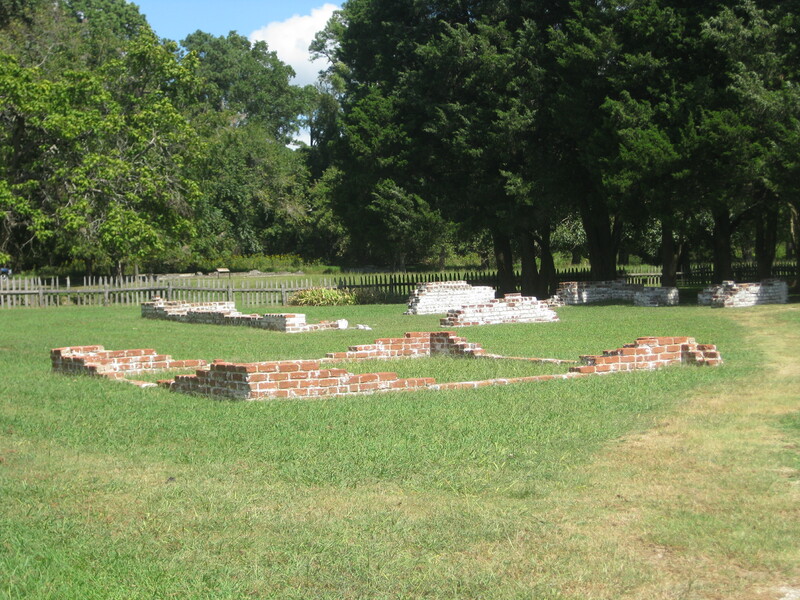 It was interesting that the colonists were required to build a church as a part of the settlement and it was one of the largest structures within the fort. You could almost picture the wedding of Pocahontas and John Rolfe in 1614. The Jamestown Colonial National Historical Park is operated by the National Park Service and by Preservation Virginia, a private non-profit organization. In 1893 Preservation Virginia acquired 22.5 acres on Jamestown Island which included the site of the original 1608 fort and the Old Church Tower. In 1934 the National Park Service acquired the remainder of the 1,500 acre island. Archeology is the main focus on the island to carefully expose and preserve the historic structures. There are active archeological sites in and around the site of the 1608 fort and replicas of the original foundations throughout what is called New Towne. A Ranger-led talk brought the history to life as we walked among the remains of New Towne. Standing within the walls of the fort I could picture the settlers as they tried to grow crops in the middle of a drought and tried to protect themselves from unfriendly Indians. 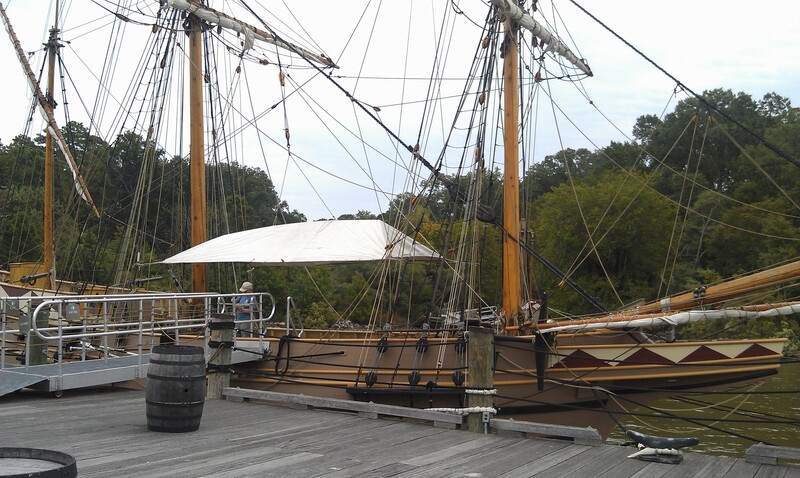 One of the last places we visited was the Mariner’s Museum in Newport News. I am a big fan of maritime museums and this is one of the best. The permanent exhibits include the Defending the Seas that tells the story of the navy’s important role in our nation’s past, present, and future, and the Great Hall of Steam that relates the story of the oceangoing commercial steamship through ship models and murals. The best exhibit is the newest addition to the museum and that is the Monitor Center. 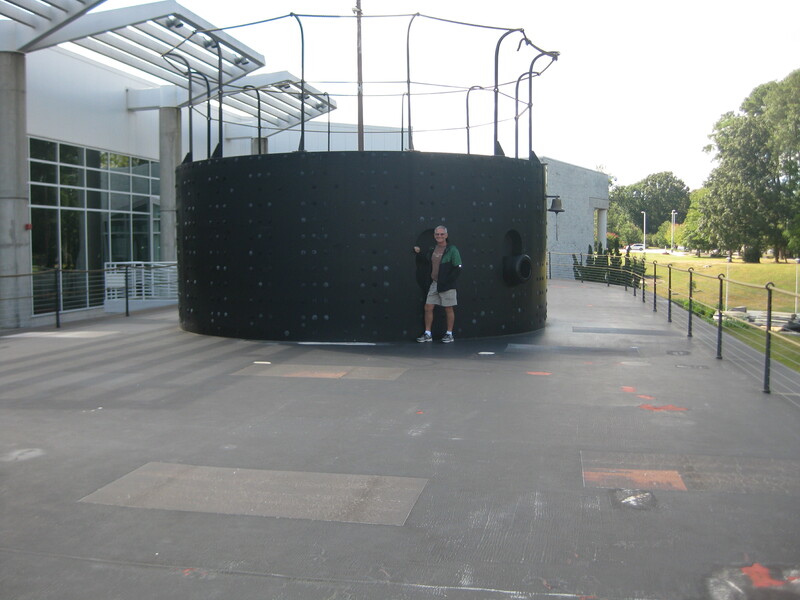 This exhibit describes the famous Battle of Hampton Roads where the CSS Virginia (aka the Merrimack) fought the USS Monitor. While the battle was a draw, the Confederate Navy was unable to break the Union blockade. The exhibit is very interactive and gives an in depth picture of both the Union and Confederate forces and their actions. 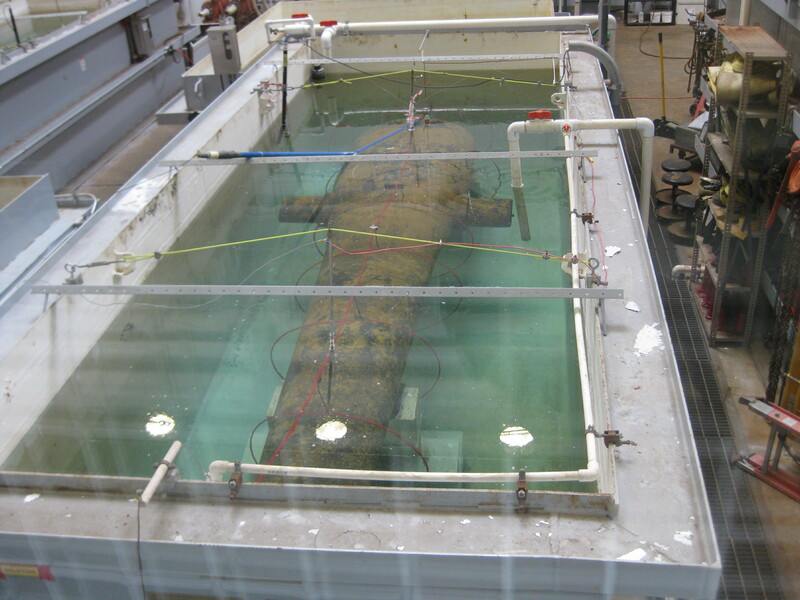 You can walk on a full-size replica of the deck of the Monitor and see the steel turret of the Monitor, and how the turret was recovered from the site of the sinking of the Monitor off the shore of Cape Hatteras, NC. We spent our last day replacing the tire that had gone flat on our drive here, packing up and generally taking it easy. The next morning (September 19th), we got an early start and headed for the Cape Hatteras National Seashore and the North Carolina Outer Banks. This entry was posted in Fulltime RV, Kentucky, Michigan Traveler, National Parks, U.S. Army Corps of Engineers, Virginia and tagged Fort Boonesborough, full-time RV, fulltime RV, Hampton Roads, Historic Jamestown, Jamestown Settlement, Mariner Museum, Ranger-led Hike, RV Forums, USS Monitor, Yorktown Battlefield, Yorktown Victory Center. Bookmark the permalink. Enjoyed reading your blog- my wife and I ( we’re in Raleigh) have considered Camp Hosting and were wondering if we might be able to speak with you about the pros and cons of volunteering in parks. Hearing firsthand from an experienced couple would help us decide whether it’s something we can or should do. We’re only 15 mins from Holly Point and have camped there a number of times over the years. Hi Bill, I’m glad you enjoyed the blog. We are having a great time and enjoy sharing our story with other couples. I’ll send you an email so we can talk in more detail.